From The Humble Loaf to GastroSmiths, Chef Dillon has certainly been through an exciting journey. He is now occupying a larger area, and has more staff on hand. 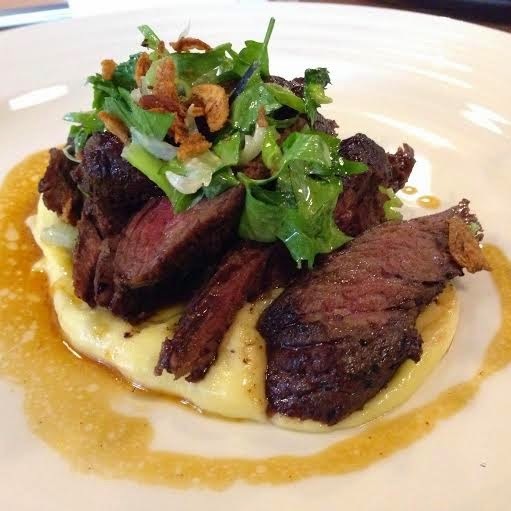 GastroSmiths has more to offer on its menu too! 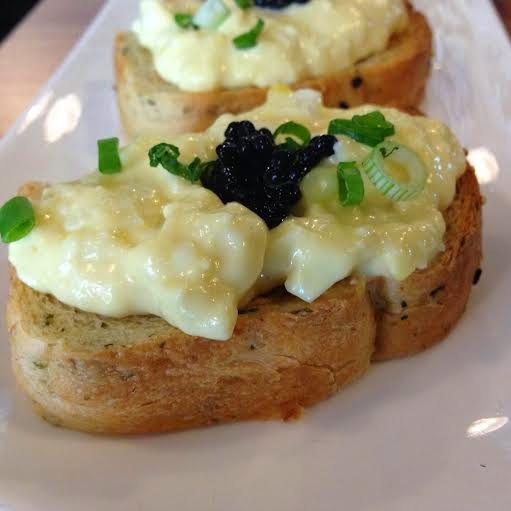 We started off with Truffled Chopped Eggs & Caviar Bruschetta (S$12 for four pieces). The smell of the truffled eggs was heaven, and it was the right combination with the Smoked Herring Caviar, Scallions and the bread was tasty and lightly toasted. I have always been a fan of their 63 degree egg dishes and so I ordered the Sea-Ly Eggs. 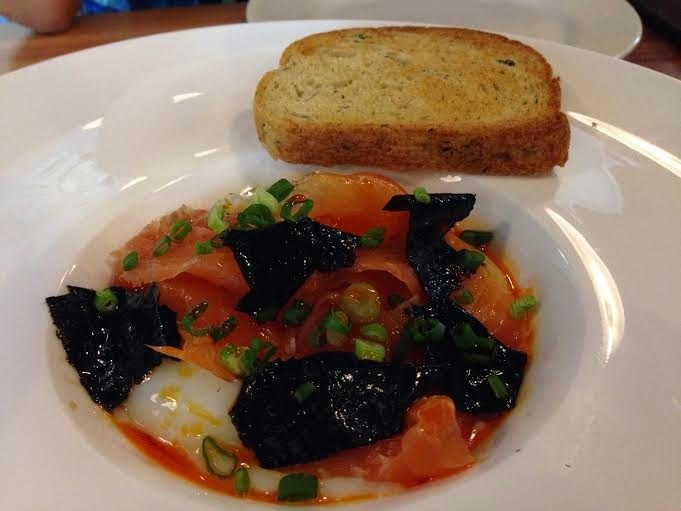 The Scottish Smoked Salmon, marinated nori and chilli went very well with the egg, which was poached to perfection. It came with a slice of lightly toasted bread, which was very handy for soaking up the remaining egg. Then it was on to the main course. 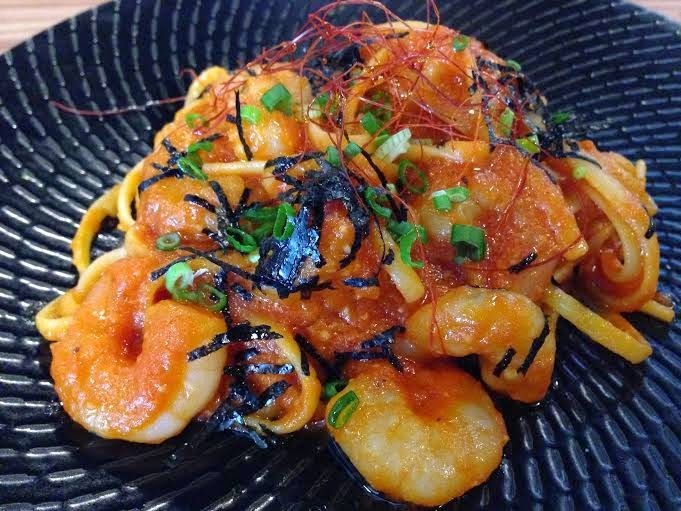 I had Shio-Koji Prawn Linguine. The tomato base with Dashi and white wine was an interesting combination and a little too tarte for my tastebuds. The linguine was cooked al dente and the prawns were also cooked to perfection. K's main meal was the 200G Onglet Steak. You can ask them to cook the Steak the way you like it. It was nicely marinated and tender because the marinate was allowed to fuse with the Beef. It was grilled nicely so had a rich brown colour and the flavour went really well with the light Potato Puree. The Herb Salad provided a lighter texture to the meat and the tasty Shallots provided a stronger after taste to add to the Meaty grilled flavour of the Steak. The Veal Jus made extra sure the Meat wasn't too dry.